Rugged, durable memory storage drives are now essential for videographers working in harsh field conditions. They can be the difference between whether the video makes it home or not. How do you choose the right storage for the application? In selecting the right memory storage drive for the application, there are several factors the videographer must consider. Will it be hard drive or SSD storage? How much capacity is needed to store video? What are the speed requirements? What type of interface is desired? How durable must the drive and its enclosure be when the crew is working under tough environmental conditions? And how much is the budget for drives and backups? Hard drives have a larger capacity for storage, but they are more susceptible to failures since they retrieve data with a spinning platter-and-head design. Excess vibrations or drops can cause data loss when the read-and-write head contacts the platter and scratches the magnetic data-storage surface. SSD is safer and more reliable in most cases, though the capacity is less and it costs more. In a recent on-line article, B&H Photo and Video, the major video dealer in New York City, cited its top brands for the mobile videographer. It cited Sony, SanDisk, LaCie, G-Technology, Rocstor and ADATA Technology as popular manufacturers for rugged storage. Sony, B&H noted, has a line of portable hard drives especially designed for broadcasters and post-production houses who need to transfer large video assets to a highly reliable, fault resistant drive. Sony’s PSZ-HB1T ($149.00 for one terabyte) and PSZ-HB2T ($272.99 for two terabytes) are hard drives housed in a tough silicon shell, along with a shock-proof hard case for transporting the drive. When housed in the hard case, Sony’s portable hard drive can withstand falls of up to 7.9-feet. Without the case, the silicon casing affords up to 6.6-feet of drop protection. The drives have up to a 122 MB/s data transfer rate as well as USB and Thunderbolt interfaces with weather-proof doors over the connectors. 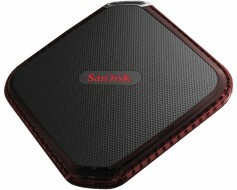 SanDisk’s Extreme 510 ($201.98) is a faster and more rugged 480-gigabyte SSD drive with USB 3.0 connection. It has sequential read speeds of up to 430 MB/s and sequential write speeds of up to 400 MB/s. The Extreme 510 also has all-terrain durability along with a rugged rubber bumper. This level of protection has gone through extensive testing to acquire its IP55 rating for water and dust resistance. 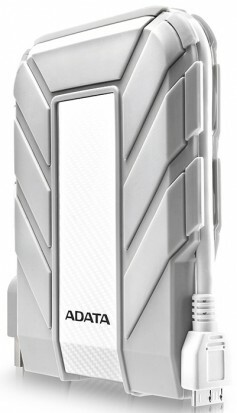 ADATA Technology’s HD710A ($109.99) contains a two terabyte hard drive and features an integrated USB 3.0 cable. It has an environmental rating of IP68, which ensures no dust at all will enter the drive. The device can be immersed in water 4.9 feet deep for up to one hour and features military-grade shock resistance. It is encased in triple-layer construction and incorporates elastic silicone material to provide shock absorption from all angles. While ADATA’s drive won’t float, G-Technology’s G-DRIVE ev ATC ($129.95 for USB and $169.95 for Thunderbolt 10 Gb/s) is a one terabyte that will float above the water rather than sinking to the bottom. It can survive water depths of up to one foot for up to 30 seconds. While most manufacturers offer one type of drive for ruggedized use, LaCie has a whole line of tough products that meets a user’s different requirements. 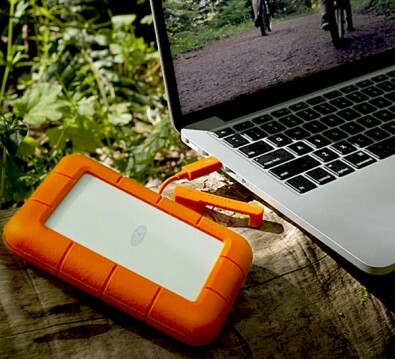 They have both hard drives or SSDs housed in a protective, rubber enclosure, as well as the Rugged RAID ($369.99) that is a portable dual-drive storage solution (two 2TB hard drives with Thunderbolt) for road use. All of LaCie’s Rugged series feature crush protection; however, its special housing can withstand up to one ton of pressure. Rather than exterior protections, B&H said Rocstor’s Amphibious X5 ($335.95 for one terabyte using USB/Firewire) comes equipped with an internal three-level architecture that suppresses the stress of drops and violent movements. The first stage is a full-length bridgeboard that firmly supports an SSD or hard drive in place. For eliminating stress on the bridgeboard, a strong aluminum rim is on board to bear external weights while dissipating heat. And the last layer is a shock-absorbent damper strip that is mounted between the bridgeboard and chassis to offer additional resistance against drops and bumps. 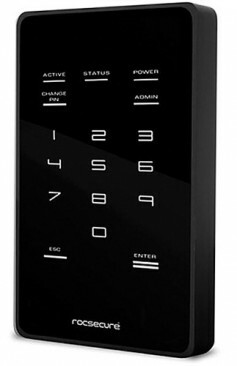 Other notable features include an embedded keypad and real-time encryption to safeguard the data from unauthorized users. As a video crew, where and how the work is done is important to selecting the right ruggedized storage. For crews who typically work indoors shooting interviews, standard storage is fine. But for those who work in extremely humid, very wet or bitter cold environments, rugged storage will help ensure the video makes it to the edit bay. Today, there are drives for every situation. Buy a major brand of the right storage for your application. Don’t skimp on price. When working under extreme conditions, a few more dollars for reliable storage is a tiny factor to ensure success.